Ox-eye daisy scientifically known as Leucanthemum vulgare is a widespread flowering plant native to Europe and the temperate regions of Asia and an introduced plant to North America, Australia and New Zealand. It is a member of the Asteraceae family, the same family as sunflower (Helianthus annuus). 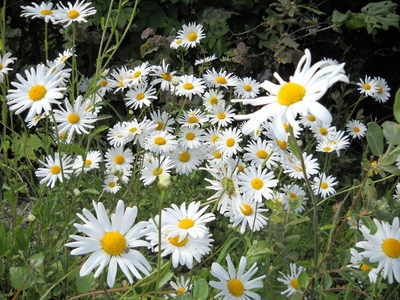 Apart from ox eye daisy it is also known as dog daisy, field daisy, marguerite, marguerite daisy, mid-summer daisy, moon daisy, moon-penny, ox-eye daisy, oxeye daisy, poor-land flower, poverty weed, white daisy, white weed, yellow daisy, common daisy, moon daisy, oxe-eye daisy, Great Ox-eye, Goldens, Marguerite, Horse Gowan, Maudlin Daisy, Field Daisy, Dun Daisy, Butter Daisy, Horse Daisy and Maudlinwort. Genus name comes from the Greek leukos meaning white and anthemum meaning flower in reference to the white flowers of some species. Specific epithet means common. Common name is in reference to the flower’s large flattened center disk, which supposedly resembles the eye of an ox. 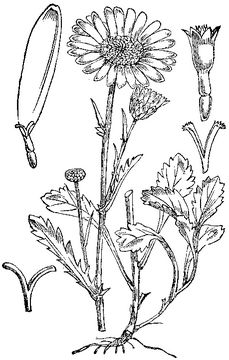 The oxeye daisy is a perennial plant in the Compositae family that looks like several flowers in the aster family. It is often confused with the ornamental shasta daisy (edible) which is a taller plant with larger flowers and a toothed whole leaf. 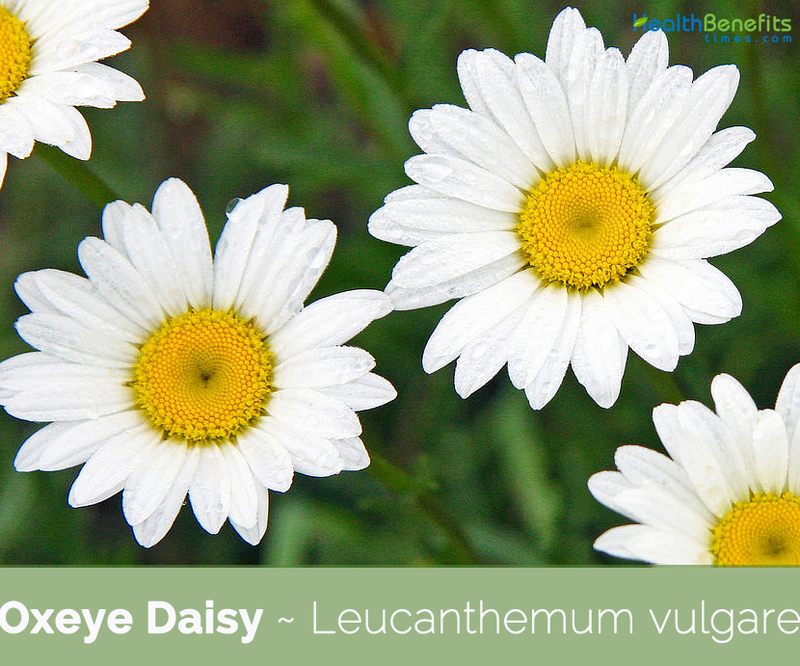 The oxeye daisy leaf is quite different from the shasta with deep lobes. 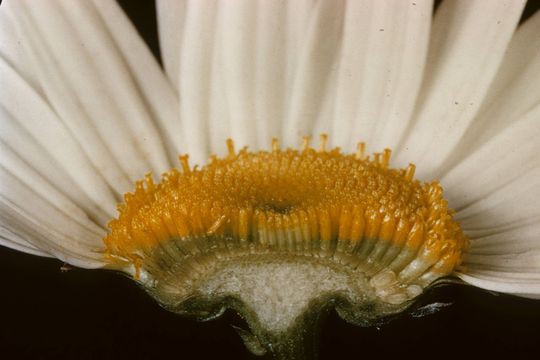 There are many white daisies that have been introduced from Eurasia as ornamental and herbal plants; however, the oxeye daisy has larger flower heads. The showy ox-eye daisy is a beneficial herb to use as a wound care remedy and for seasonal allergy relief. 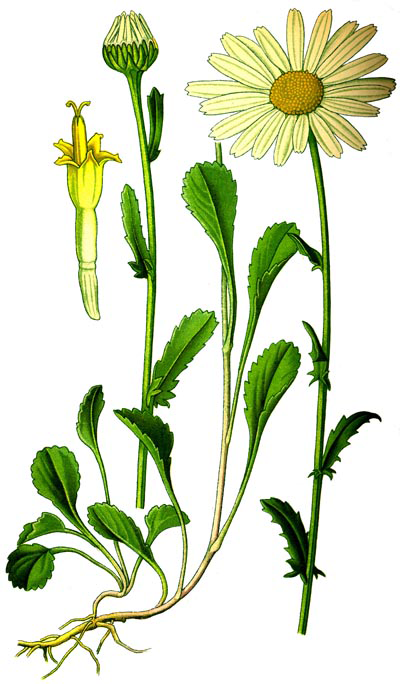 Ox-eye daisy is an astringent, slightly aromatic, bitter, and drying herb. 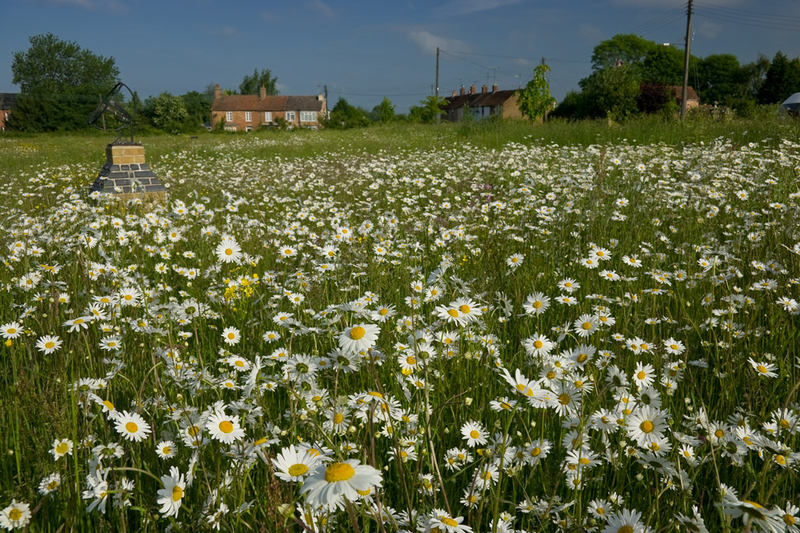 Oxeye Daisy is a typical grassland perennial wild flowering ornamental plant that grows about 1-3 feet (30- 90 cm) high by 1 foot (0.30 m) wide but occasionally reaching up to 1 m in height. 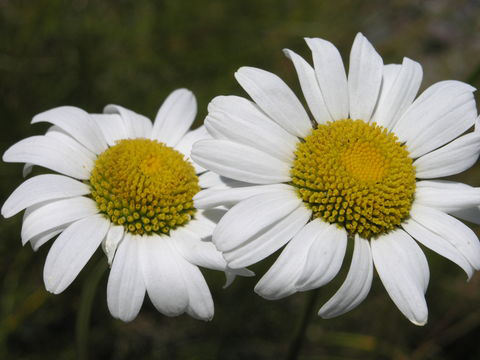 Although native to Europe, this is the common white daisy that has naturalized in mesic to dry prairies (including old cemetery prairies), weedy meadows in wooded areas, vacant lots, areas along roads and railroads, landfills, pastures, and waste areas. 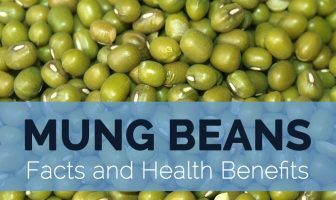 The plant is easily grown in average, dry to medium, well-drained soils. 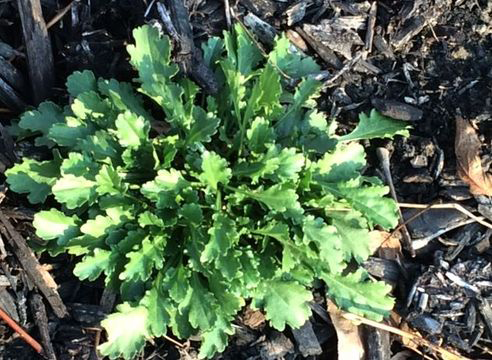 The plant has perennial and somewhat creeping roots. Stem are erect, simple or slightly branching, usually 1-2 per plant, but may form thick clusters. They are decumbent at their base, usually 30-90 cm in height. 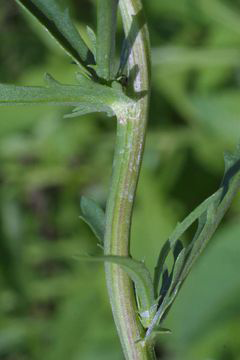 The stem is slightly hairy towards the top and hairless at the bottom, with alternating leaves. 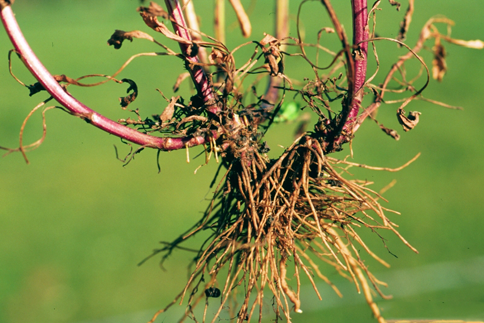 It spreads readily and is occasionally considered a noxious weed, especially when it grows in crop fields and pastures. The leaves are slightly hairy (i.e. puberulent) or hairless (i.e. glabrous) and alternately arranged along the stems, but form a basal rosette during the early stages of growth. The lower leaves are relatively large (4-15 cm long and up to 5 cm wide), stalked (i.e. petiolate), and have slightly toothed (i.e. serrate) and/or lobed margins. Upper leaves are smaller (up to 7.5 cm long), narrower, and usually stalk less (i.e. sessile) with deeply toothed (i.e. serrate) margins. The leaves are dark green on both sides. When crushed, all parts of the plant have a disagreeable sour odor. Tender basal rosette leaves have a carroty odor. The flower-heads (i.e. 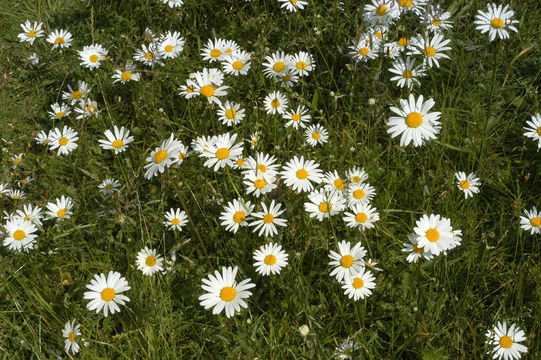 capitula) are like a typical ‘daisy’ and have numerous (15-40) white ‘petals’ (i.e. ray florets) surrounding a yellow center. These petals (i.e. ray florets) are 10-20 mm long and the yellow center consists of many tiny tubular flowers (i.e. disc florets), each about 3 mm long. The flower-heads (2-6 cm across) are borne singly at the tips of the branches and their bases are surrounded by several overlapping rows of green bracts (i.e. involucral bracts) with brownish colored margins. Flowering occurs mostly during late spring and early summer. These flowers bloom anywhere from May to September depending on location. Store dried flowers in an airtight container to preserve freshness. 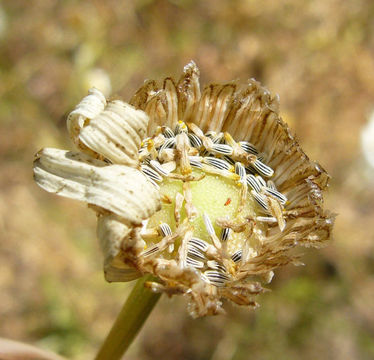 Flowers are followed by obovoid to cylindrical achenes with 5-10 equal raised ribs, 2-3 mm long and 0.8-1 mm wide. These achenes are dark brown, black or grey in color. 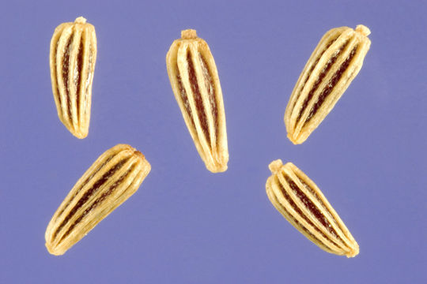 These seeds have ten protruding lengthwise (i.e. longitudinal) ‘ribs’ but are not topped with any scales or hairs (i.e. they have no pappus). Whole plant, and especially the flowers, is antispasmodic, antitussive, diaphoretic, and diuretic, emenagogue, tonic and vulnerary. Plant has been used successfully in the treatment of whooping cough, asthma and nervous excitability. Externally it is used as a lotion on bruises, wounds, ulcers and some cutaneous diseases. Decoction of the dried flowers and stems has been used as a wash for chapped hands. Distilled water made from the flowers is an effective eye lotion in the treatment of conjunctivitis. It has been used widely in traditional medicine for treating internal disorders and as a lotion for skin conditions. Topically it may be used for ulcers and sores. Flower infusion is beneficial for relieving chronic coughs and for bronchial catarrhs. Root is also used successfully for checking the night-sweats of pulmonary consumption in America. Decoction made of them and drank helps to cure the wounds made in the hollowness of the breast. Leaves bruised and applied to the privities or to any other parts that are swollen and hot, doth dissolve it, and temper the heat. It is diuretic and astringent, useful for stomach ulcers and bloody piles or urine. It is used as a vaginal douche for cervical ulceration. It was traditionally used in ale as a cure for jaundice. Blend it with plants such as echinacea and plantain to help clear infections. Prepare the aromatic and astringent leaves dry or fresh as a hot tea to soothe allergies and tickling coughs, and to dry a leaky, drippy, runny nose caused by early summer hay fever. Blend it with other drying aromatics such as ground ivy to help dry a runny nose and open sinuses. Unopened flower buds can be marinated and used in a similar way to capers. Young spring shoots are finely chopped and added to salads. Young leaves may also be eaten as a salad. Root is said to be edible raw too, preferably in the spring. Flowers can be tossed into a salad or pickled. Whole plant is permeated with an acrid juice, making it obnoxious to insects. When crushed, all parts of the plant have a disagreeable sour odor. It is also grown as an ornamental plant in gardens. According to Linnaeus, horses, sheep and goats eat the plant, but cows and pigs refuse it on account of its acridity. Girls put the flower under their pillows to see dreams of their future husbands. It may impart an “off” taste to the milk of lactating animals if eaten. A vigorous daisy can produce 26,000 seeds per plant, while smaller specimens produce 1,300 to 4,000 seeds per plant. The plant is also used for protecting babies from evil influences and spirit presences, and worn or carried to attract love. Flower mutilating game “he loves me, he loves me not” was based on this particular kind of daisy. 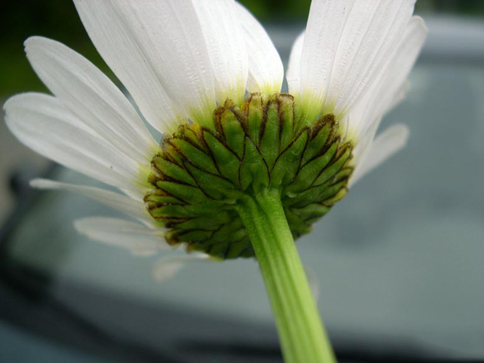 In plant symbolism, the ox-eye daisy represents patience. 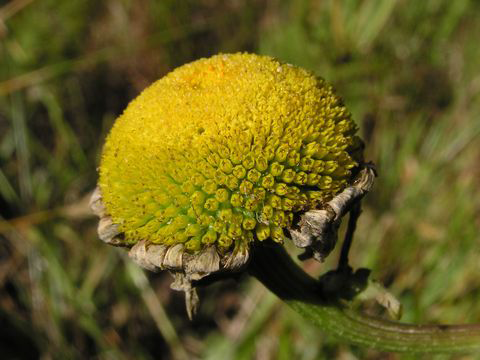 People with allergies to pollen may be especially sensitive to this plant and others in the Asteraceae family. Do not use in patients with severe kidney disease/infection or bladder control problems. Do not use in patients with kidney stones, obstructed bile duct or gallstones. Leaf Basal leaves are stalked, spatulate to obovate and irregularly dentate) to regularly crenulate 10-25 cm long and 3-7 cm wide. 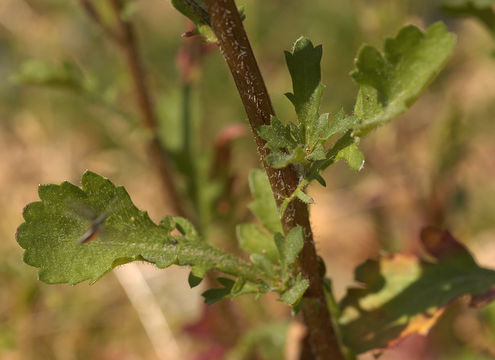 Stem leaves are smaller, alternate, mostly sessile, obovate to narrowly lanceolate becoming ligulate apically with coarse teeth and the base usually deeply lobed or fringed with slender segments.